The Towpath Volunteers have been bringing Our American Heritage to Life for over 30 years. Through visual representation, musical and rudimental excellence, the corps has become one of the most highly recognized and recruited groups in the country. The Snare and Bass Drummers perform with synchronized perfection, which looks fantastic but leaves little room for drummers to show individual talents. To showcase the ability of the foundation of the corps, the Towpath Volunteers present the "Towpath Volunteers Drum Line". 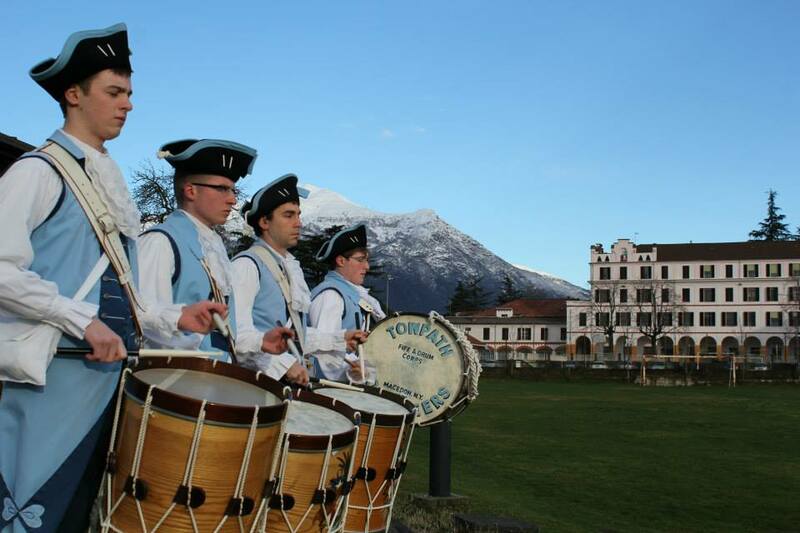 The Towpath Volunteers Fife and Drum Corps Drum Line performed the "Sprit of 1776" written by Drum Sergeant Adam Chapin during the corps trip to Italy to perform at Historic Carnival. Pictured here is Sean, Jake, Adam and Nick rehearsing with the view of the Swiss Alps in the background. The 3 and 1/2 minute solo has not only American Rudiments but Swiss Rudiments as well. With a combination of arm and head movements, the song is extremely hard and impressive to anyone that has the opportunity to see it. Savannah, GA Drum Line Performances! The long wait has finally ended!! The Towpath Volunteers Drum Line performed for the first time, in uniform, at the invitational breakfast held by St. Patrick's Day Parade General Chairman, Michael Foran. The many hours of practice paid off as the Drum Line performed the newest drum solo, written by Drum Sergeant Adam Chapin, flawlessly! The drummers were pumped! They played at the breakfast, they jammed with another fife and drum corps prior to the parade and then marched a 3 mile parade! Are they done yet? No Way! They played on River Street for huge crowds after the parade, took a short break for dinner and then played some more, finally stopping around midnight, after 18 hours of almost continuous drum playing! What makes the Towpath Volunteer Drum Line so great? They Love to play the drums!! Congratulations to all for a job well done! What do you do to provide rambunctious drummers a chance to show off? 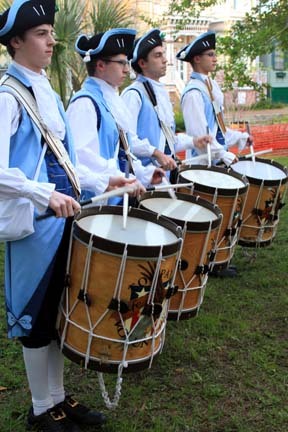 In 2011, we created the Towpath Volunteers Drum Line! This is not a singular performance style group but a group that performs in many settings and styles. From a strict military presentation, to a "sanitation crew" that bangs on garbage cans, to sweeping and tapping push brooms. There is no better practice to learn, or way to improve, as a drummer than actually playing and enjoying it!! So don't be surprised when you are at a festival or event and suddenly find the people who were innocently picking up papers suddenly turning their garbage can up side down, pulling out some drum sticks and pounding out dynamic rhythms with an unmistakable sound and flair!